They’re one of the most essential household appliances and most of the time we take them for granted. When things do go wrong with your washing machine, it’s worth checking a few basics before calling an engineer. Where possible, disconnect the appliance from the power before attempting a home fix. Here’s a guide to some common problems you may encounter as your machine progresses through its cycle. Make sure the door is properly closed, check that inlet hoses are clear and that the water supply is connected and functioning. If all if these things are in order you’ll need to call a repair man. There are a number of things that can cause this, including worn brushes, drive belt problems, or a faulty motor or control unit. You’ll need an engineer to figure out exactly what’s gone wrong. If you don’t have a regular repair man just run a search for washing machine repairs East London, or wherever you happen to be living. This generally means that the timer, thermostat, or heater had failed. If it’s a timer problem you may be able to work round the problem on a temporary basis by advancing the control dial manually. A rattle while the drum is moving could be due to something stuck in the drum, coins and bra wires are common culprits. You may be able to remove the drum paddles to get to the offending item. It’s also worth checking the drain filter to make sure that’s clear. 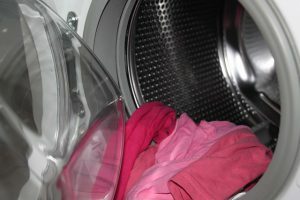 A noisy washing machine may also indicate failed or worn bearings. Try turning the drum by hand when the machine is empty. If you hear a rumbling noise or can feel ‘play’ in the drum, it’s likely that the bearings need replacing. This usually means there’s a blockage in the drainage filter, or the pump itself has failed. The first thing you’ll want to do is empty the water so you can rescue your laundry. Pull out the drain hose, pop it into a bucket and let gravity do the work. Be ready to change the bucket if you need to! Problems with the spin cycle are relatively common washing machine faults, the good news is that they’re generally relatively inexpensive and simple to fix. Balance sensors will override the cycle if the clothes are unevenly distributed and could case the machine to vibrate. This can happen if you’ve overloaded the washer, or if you’re trying to spin just a few items. Try reloading light loads or removing a few items from heavy ones. If this fails, brushes may need to be replaced. This will usually be due to water not draining, or a faulty door lock. Drain manually as above. If that doesn’t fix the problem you may be able to remove the top of the machine and release the lock from the inside. If you always use low temperature washes and biological detergents you could have a build up of bacteria or even mould in the machine. Try running a hot empty wash. You should also clean out the soap dispenser regularly, and leave the machine open to air for a few minutes after you’ve removed the washing. Tears in clothes indicate foreign bodies in the machine, or damage to the drum. A failed thermostat can cause the water to overheat which will also damage delicate clothing. Unlike laundry symbols, washing machine fault codes are not universal. Your owners manual may help you identify the problem and even suggest a fix. In other cases you’ll need an engineer to trace the fault. Don’t be tempted to ignore a fault code, even if the machine seems to be functioning normally. Some codes are ‘early warning signs’ and fixing the machine at an early stage could save you time and money in the long run.